I received my most recent box from Stitch Fix in mid-July. They had offered me a free styling and of course I couldn't pass that up! Apparently the free stylings go to a stylist that initiated it, or something? While my last few fixes have been put together by Kat, this time my note says I was chatting through email (when I said, "Sure! I'd love a free styling!") with Meagan, but then Linzie put the box together for me. This shirt still isn't wowing me though. This is the Maygen Flutter Sleeve Cupro Knit Top from Coin 1804. I liked the feel of the fabric, and the nifty criss-cross detail that my stylist said matches a shirt I had pinned on my Pinterest board. But, I felt the actual shape of the shirt was almost too flowy and ended up not very flattering. I sent it back, and I'm still glad I did. The retail value was $54. You may want to make a note of this picture. I usually cut my feet off in pictures, because...feet. Looking at these Ethan Woven Gladiator Sandals from Report Footwear again, I could actually see myself wearing them. But with a $60 retail pricetag and no arch support, I sent them back. But somehow my feet don't look as icky as I see them in my mind. Go figure. Overall, when the time for decisions came, I kept just two items from this box. Looking again now, I'm either more forgiving of how I look, feeling rich, or in the mood to shop. It wouldn't be hard to convince me to keep the other three, but that time has passed. 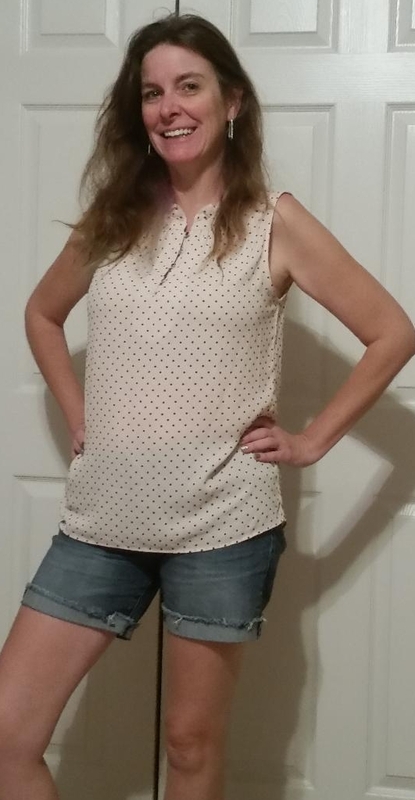 I'm excited to start getting out some more of my fall and winter clothes from Stitch Fix. They definitely set me up with some nice and cozy outfits last year that will be perfect again as Michigan cools off. Looks like some cute options. I like that dress too!